Our German Shepherd Jack - He chose the right home. About 3 years ago, I was walking our Beagle out in the front yard, right before bed. There were no porch lights on, so it was pitch dark outside. As I reached for the door handle, to walk back inside, I felt something against my leg. I look down, startled to discover a young, 90% black German Shepherd male is standing on the porch, wanting into our home. Having a soft heart, and a love of German Shepherds since childhood, I bring him into the house. No collar. No tags. No tattoos. Just a big, beautiful, obviously pure blooded GSD with huge feet! My first thoughts were "NO WAY can we keep this dog". We already had our hands full with our Beagle. So the next day I take the GSD to be scanned for a microchip. Nope. Put up flyers at supermarket: check. Visit the animal control department: check. Go door to door in my neighborhood: check. Nobody knew this dog. Nobody had reported one missing. Still quite sure we didn't need another dog, we asked animal control to come take him away. The officer was at our front door, ready to take him, and my gut said "don't let him go". I was already becoming attached to him. So we decided to keep him, and formally adopt him. And we have never regretted it. He (Jack) has become my very best friend in this world. He is a loyal companion. He listens to every word that comes out of my mouth, ready to spring into action if "ball", or "Frisbee", or "walk" is even whispered! We now spend about 2 hours a day walking in the 210 acre park a few hundred feet from our home. I probably saved his life, and he has rewarded me by making my life so much better. By walking Jack every day, I have lost 40 pounds, and improved my health in so many ways! So he chose the right place to live! Comments for Our German Shepherd Jack - He chose the right home. Probably abandoned in the woods by some family that decided they couldn't care for him any more. I got my current GSD under similar circumstances. I could slap people like that! Anyway, lucky for you. He is beautiful...and I'm sure he has provided you with much happiness. When I was a kid we had a gorgeous male german shepherd show up on our door step like that. To this day he was the best dog I have ever owned! Great story! I have 1 and love her very much. It's never a dull moment with Sheba around. She will be 2 in June. I love that picture. He is beautiful! I own two, it was 3 but just lost my best friend in March 2009. GSD are so smart. I get attention when I say: Bye Bye, Eat, Go Tee Tee, Go Stinky, Ball, Stick, Night Night, Here, OH, my favorite, Nine! (German for NO) Nine brings on pasted back ears and guilty glares. I just love this breed. Enjoy Jack and when you take him to the vet ask about Hemangiosarcoma. 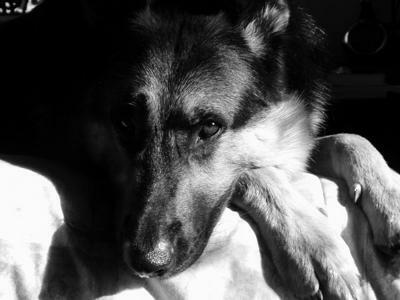 Watch out for this deadly cancer related to the GSD breed. Take care.